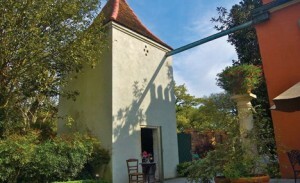 « Homepage / Gourmet / "Plantation Pleasures: Dining with history"
On a sun-dappled spring morning we set out to revisit the great plantations of River Road. We embarked on the winding two-lane highway that follows the banks of the Mississippi River between New Orleans and Baton Rouge, where several beautifully restored plantations reside. Before the Civil War, this stretch of the river was home to more than four hundred of these ornate manors built by entrepreneurs who staked their claim and fame while erecting elaborate monuments to their success. While there are many historic sites worth discovery along River Road, only a select few plantations offer fine dining that is on par with some of the best gourmet experiences in the state. We found the most splendid restaurant in Darrow at Houmas House Plantation (225/473-7841), which is one of the South’s oldest and most elaborate estates. It boasts Latil’s Landing, which was named “Best New Restaurant in 2005” by Esquire magazine. Set in the rear wing of a 230-year-old house built by Alexander Latil, its dining rooms are enhanced with a museum quality collection of art and artifacts, cypress mantels, and wood-burning fireplaces. The dining experience is embellished with French Limoges china and the artful cuisine of Chef Jeremy Langlois, who lovingly presides over his own herb garden on the grounds. On the day we dined we began with mint juleps in the nearby garconierre known as the Turtle Bar, and strolled through the lush gardens, finally taking our place in the dining room. The feast began with pan-seared medallions of foie gras set on top of toasted bread and garnished with Louisiana berries, followed by a smooth, addictive bisque of curried pumpkin, crawfish, and corn. We enjoyed entrées that included papaya stuffed lobster tail with fire-roasted shrimp and crawfish tails on a Creole tomato risotto, and pan-sautéed fillet of black drum set atop lobster ravioli with baby tomatoes and flash-fried oysters with a crawfish cream sauce. The meal ended with mint julep custard and a crisp apple gallette as one of the tour guides serenaded our group at the table. Nearby at Nottoway Plantation (866/456-8687), which resides on 37 acres of land in White Castle, we enjoyed a fine meal in stately Randolph Hall. Although not on par with the style of cuisine offered at Houmas House, it was an enjoyable journey into the heartland of Louisiana cuisine. We sampled the “two-step” gulf shrimp and farm raised catfish, which was quite fresh, served with Cajun hushpuppies and jambalaya, and the Zydeco salad chock full of grilled shrimp, blackened chicken, marinated crab claws, and fried catfish. For more exclusive dining with a group (by reservation), Nottoway offers a ballroom on the second floor of the plantation where guests can enjoy a seven-course meal and a special gentlemen’s study in which to retire. We later traveled off the beaten path of River Road, about 35 miles outside of Baton Rouge, to the Myrtles Plantation in St. Francisville for dinner. Some say that the mystical occurrences of the Myrtles (known as “one of America’s most haunted houses”) are mere mirages; others swear that the spectral inhabitants are authentic. Whatever you choose to believe, Varnedoe’s Carriage House restaurant, located on the grounds of the Myrtles, is destined for the culinary hall of fame. This is due to the combined talents of Chef-owner Scott Varnedoe and Chef Eric Sibley; both have been awarded numerous medals for their gastronomic talents. We enjoyed a delicious shrimp and crawfish boil mirliton cobbler, some spicy voodoo barbecue shrimp, and the fried green tomatoes as starters. Main courses included a pecan-crusted soft shell crab set on top of tasso cheese grits, and a delectable basil-encrusted mahi mahi set atop artichokes, spinach and bacon-braised lilies served with pernod-infused chicken glaze, and topped with wild mushrooms and jumbo blue lump crabmeat. The meal was divine and we met a few colorful locals at the bar. Taped jazz enlivened the mood. Brunch is served on the weekends, with offerings that range from duck and goat cheese enchiladas to eggs Sardou. You can also get a complimentary country breakfast at the plantation as part of the B&B experience, served in the homey little gift shop buffet style. Although St. Francisville is a stretch from River Road, Varnedoe’s is definitely worth the drive for a memorable dinner shared with other-worldly spirits under the stars. Here you can write a comment to the post "Plantation Pleasures: Dining with history"